HS2 is a new high-speed rail network that will run initially from London to Birmingham and then to Manchester and Leeds. The 400m long trains, carrying as many as 1,100 passengers, will operate at speeds of up to 250mph (faster than any current operating speed in Europe). Reducing journey times from London to Birmingham from 1 hour 21 mins to 49 mins and London to Manchester by an hour. When complete, this once-in-a-lifetime unparalleled venture in modern engineering will link eight of the UK’s major cities. With trains able to run 14 times per hour in each direction, HS2 will serve millions of people, freeing up extra capacity for local passengers and freight services on the existing rail and road networks. 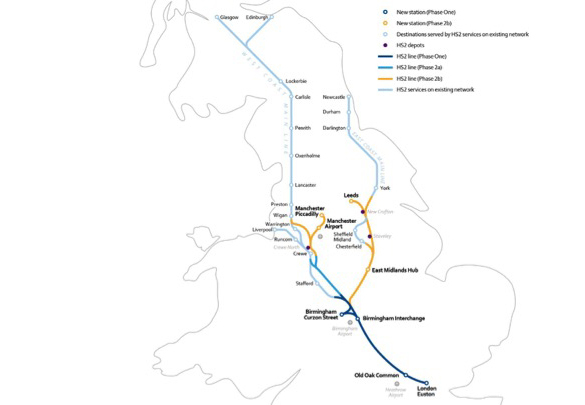 Work on Phase 1, London to the West Midlands, began in 2017 with services expected to start in 2026. This investment will require new state of the art stations, capable of accommodating the HS2 trains and increased passenger numbers. HS2 are currently defining the design elements for their stations and are aiming to set the industry benchmark for rail wayfinding and signage. During this talk Laura Kidd, Head of Architecture, will present the HS2 vision and the impact that this has on design thinking. She will outline the design approach for stations and discuss the station common design elements and wayfinding and signage requirements. With considerable experience of procuring and implementing wayfinding and signage within the rail sector, she will discuss the key things that she looks for from a wayfinding and signage consultant. Book now to secure your place to find out about the wayfinding and signage plans for arguably the UK’s most significant investment in national infrastructure and what clients expect from their consultants. Laura Kidd is a chartered architect with nearly twenty years experience specialising in station architecture. She has played a part in the successful delivery of several of the most recent prestigious main line rail and underground station projects. Laura has been Head of Architecture for HS2 for five years and in this role is responsible for setting the design aspirations and requirements for the new HS2 stations.